I am adding a Second place Prize---Woohoo. I got so excited about giving one thing away, I'm gonna give away a second gift. 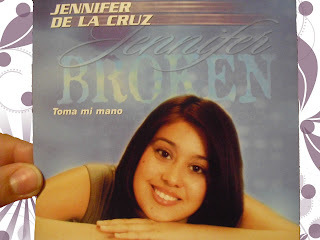 Music CD "Broken/Toma mi Mano"
For more info on this CD see the blog above this one =) Can't wait to see who wins! Haha, my favourite ice cream is chocolate - or hazelnut maybe? And my favourite jewelry are rings, so I´d love to win yours! Fun ring! I am an American gal married to an Aussie guy living in Queensland! My favorite ice cream is Sarah Lee's Cappuccino . . . I've only ever seen it here in OZ. its prety! please enter me in the giveaway, and check out my blog tomorrow. I need to photo and write up a post to be apart of the giveaway too! Love that ring! Hi, I'm Lynda from Southern Indiana who loves to garden, bake and create. Chocolate is my favorite - really chocolate anything - just pour it on! Come visit my blog and enter. I'd love to give this to my daughter. My favorite ice cream jamoca almond fudge though it's hard to pinpoint one flavor love Ice cream. Happy days to you and thank you for participating. Hello! Great giveaway! My favorite ice cream is mint chocolate chip! #480, easily amused, hard to offend . . .
Greetings from Maine. Maple walnut is my favorite but of course remember I am in Maine with Maple Syrup. This is so much fun. Please sign me up thanks. i absolutlely love this its sooooooo awesome...lol i hate ice cream i know i know ......I would rather have some mashed up butternut squash with hot sauce or Apple sauce with african bird pepper cinnamon and a dab of maple syrup......i know im a freak don't hates me though! Triple chocolate with chunks of chocolate in it!!!! LOVE this ring --- gorgeous. Hi, I am Sandi from Minnesota and my favorite ice cream is Chocolate Revel. I loved ordering it in the cone when I was a kid. Then I'd sit on the stool in the cafe and spin around til my mother would tell me to stop......or I got dizzy. Thanks for a fun memory. Now to that lovely ring. I would love to be entered for a chance to win your beautiful Vanessa ring. I will keep my ring finger crossed with my pinky so that my chances will improve. :-) I am #466 on the Magic Carpet Ride. Please stop by. Gorgeous, I'd love to have this beautiful ring. What a beautiful ring. My favorite ice cream is Vanilla. LOVE THE RING!!! Need the ring!!! Toasted almond fudge is my favrite ice cream! 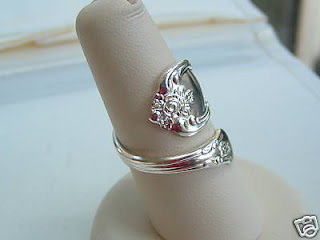 I would love a chance to win this beautiful ring... My mom had a ring made from a silver spoon and I loved it! Please enter me! If you have a chance I'm also on this wonderful giveaway! What a pretty ring. Please count me in your fabulous giveway. Stop over to see me too if you get a chance. My favorite icecream......Grape Ambrosia......YUM! I'm Shilo from NY and love moose tracks ice cream or fudge swirl ice cream. Oh, goody another jewelry lover. I am so glad to have found you on this Magic Carpet Ride!! Please enter my name in your giveaway and be sure to stop by to sign up for my beaded bracelet giveaway!! Your ring is wonderful. I love the elegance and simplicity of it. I don't really eat ice cream, but I love pistachio. My OWOH giveaway is #79 on the magic carpet ride. What a great prize! Your ring is lovely! My favorite ice cream is anything with heath bar or carmel in it. Please enter me in your drawing and stop by my blog to get a chance at my beautiful hand dyed scarf! Hi! I'm Beth from Plymouth, NH. I just love your ring. My favorite ice cream flavor is mocha almond fudge. Love this ring! It's made with a spoon, right? Haa, I love every and any ice cream :) The ring is interesting. Please count me in! I have always wanted a spoon ring! Please enter me in your fabulous give away! And stop by #657 and say hello. What a fantastic gift - please enter my name. Also visit my blog and sign in. Many thanks! Favorite ice cream is Cherry Garcia. I have always wanted a spoon ring! I'll try this again. My favourite icecream is orange/chocolate and this is a fabulous giveaway. The ring is beautiful. Ooooh, this is just stunning!!! And I love silvery rings! So unusual! A spoon for a ring! I happen to like Ben and Jerry's Cinnabons, by the way :) Please sign me up for your lovely offering! What a gorgeous ring! My favorite ice cream is Rocky Road. Please enter my name in your drawing. Drop by www.taffetamoon.com to see what I'm giving away. Swooping in from Alabama on my Magic Carpet. Such a wonderful adventure. So many beautiful places....so many interesting people...so many talented artist. Love your giveaway...please enter my name. When you take flight again please come by Southern Ooaks #760 and sit for a spell...have a glass of Sweet tea...look around and then enter for one of my treasures. Hello! I'm a rarely behaved woman living in FL and my favorite ice cream is cookies and cream... yum! Love the ring! OMG!! How divine is this ring? I simply love it!!! Oh, please put me in for a chance to win!! This is such a beautiful giveaway!! I love your blog too!! Wow; how lovely....... I 'll love to win this beautiful pie of art. that is a really pretty! thanks for your generosity! What a lovely giveaway! My favorite icecream is Pineapple Upside Down Cake by Blue Blue. Beautiful work - I'm amazed at the wonderful items on all the sites. This is my first time I've taken part and am having a blast. ohmygoodness what a gorgeous ring!! I wear rings every day on as many fingers as possible - just silver. This would match my collection so well - please count me in! Its so original! isn't this fun? Its my first giveaway too! favourite icecream?? Does sorbet count?? Lemon sorbet!! Cute ring! Vanilla is my favorite with lots and lots of chocolate on it. This is a GORGEOUS giveaway, please count me in the draw. You can visit me as well, I am #5 on the list. I love your ring, so beautiful! And my favorite ice cream is Key Lime Pie! Please take a moment to "ride the carpet with me" ticket number 194- Dragonfly Design Studios. I love all ice cream except honey ice cream. Got a 2 litre bucket of vanilla from my parents for my 10th birthday! LOL. Love this original ring. I would love to be wearing it!! omg What a TRULY wonderful gift, IT IS GORGEOUS!!!! I will be back to have a proper look at your blog at my leisure. Ooo! My Goodness, I love it! Please include my name! Oh my gosh, this is so awesome. I would love to be entered in your giveaway. This ring is fantastic! I'm a sassy girl who likes to be a little on the edge for my age (40). How creative. My fav ice cream is Chocolate Mousse Royale; so yummy. Thanks!! Beautiful ring! Great. Please count me in. Feel free to visit me at # 153 on the magic carpet. Enjoy the ride. The ring is gorgeous, thanks for the chance to win. Fly over to my blog and enter mine. Holy cute spoon ring, Batman!!! I love this!!! Thank you for such a wonderful giveaway! Hi very Cool. Love your giveaway. Please count me in and fly over to see me too. Awesome giveaway! I'd love to enter your giveaway. It's been so great meeting all these fantastic people through OWOH! Ride over to #416 if you have a chance! What a gorgeous ring, Jennifer ! I`m happy to have a chance of winning your wonderful giveaway. (my favourite ice cream is chocolate chip). Love your blog and beautiful ring! The ring is beautiful--I'd love to enter! what a fun ring! My extremely artistic sister (Aileen’s Musings # 408) turned me on to this magic carpet giveaway. Lucky me –now I get to see how creative everyone is. This is fun. Please enter me in your drawing then stop by and enter my sister’s blog. I,m amazed at how many don't read about each others blogs,thats the whole point! I Love chocolate anything in my ice cream. Googoo cluster has to be my favorite. I'd love to be entered in your give away. But if i win please wait for me I will be out of town till Thursday I gave my DH directions just in case ,but you know how that goes! stop and enter mine #86 if you can! LOVE the ring and am always up for being introduced to new music so please include me in your draw....with thanks. Favourite ice cream is Baskin Robbin's Jamocha Almond Fudge. MMMMMMM Need some now! Gorgeous giveaway!!! !Love both ring and CD! What wonderful giveaways, your ring and CD are so generous, please enter me for a chance to win and stop by #234 on the magic carpet when you get a chance. What a gorgeous wrap ring...I would LOVE, LOVE, LOVE to be the winner! Please enter me and then hop on over to my giveaway! Please include me in your drawing. Thank you so much for this opportunity to join in on the fun. Lovely! Thanks for the chance. I like Death by Chocolate ice cream. Yum! I remember when jewelry like this was all the rage in the 70's! I love the ring and the c.d...please include me and thanks for entering my drawing too! what a fab giveaway, please count me in. Why not pop over to my blog and join in my giveaway too. Hi "Know How Moms," what a lovely idea and post you have. I love the ring and cd. I'd love to win. I absolutely love your gifts. Please take time to visit my blog, too, for a chance to win my book, 16 x MOM: A Mastery of Motherhood. I'm working on getting all the country flags. I promise to revisit your's too. what fab gifts! I'm so excited to be able to be in your drawing! what a nice blog design! wow, beautiful ring! Beautiful ring! Please enter me! Please join my magic carpet ride too! Cool ring please include me and come see my giveaway at #75 too! What a lovely ring, please include me in your giveaway. What a beautiful ring! My favourite ice cream is Rocky Road but because I can't get that here, I'll have to say vanilla. A Dreamer & An Enthusiast Of Fantasy Black Cat Art. Oooooh I would Soooooo love to win this ring you have created!! Please add my name to the growing list of hopefuls. What a gorgeous ring and it would look great on my finger :> I am Regina from Dallas, GA. My favorite ice cream is chocolate with some kind of nuts & fudge in it. And the second runner up is either coffee ice cream or mint chocolate chip. these are lovely giveaways please count me in. wow! great giveaways! thanks for the chance to win! mmmmm Chocolate fudge ice cream !!! 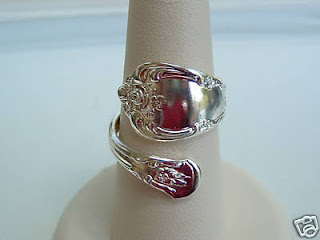 Oh my, I had a sterling spoon ring years ago that I loved! This brings back wonderful memories! Chocolate ripple is my favorite flavour of icecream! Lovely giveaway. That ring looks so delicate. what a beautiful ring - I would be honoured to wear that. Favourite icecream - hmmmm - I think that it would have be vanilla - plain perhaps, but with a good quality vanilla it is just perfect. Thanks for stopping by and entering my giveaay. Your name is in the hat. Please enter me in your giveaway too. Hello & very nice to meet you! What a lovely "Vanessa" ring!! Please drop my name in the hat, & thnx :) I am Lynda from Toronto (blog: Retasroses Vintage), and my favourite ice cream would have to be Pistachio almond! Oh my this is lovely! Please enter my name in the hat for this fun giveaway!! I am visiting with One World one Heart. I hope you are enjoying visiting all the blogs too. Please enter me into your draw. Greetings from Canada! My favorite ice cream is cookies and cream...yummy! Please count me in for your wonderful giveaway! Don't eat ice cream Jen, it doesn't like me. Can I put sorbet, If I can then it raspberry or lemon or both together. Please count me in. When you get some time please fly by my blog on your magic carpet, I am OWOH #907. Thank you so much for participating in OWOH. Beautiful ring! I am not a huge fan of ice cream. What a cute litte ring! Please include me in the draw and if you haven't yet visited my giveaway I would love to see you! what a great giveaway.lovely ring! thanks so much for the opportunity to enter the drawing. so delighted to meet you through this event. I hope you'll stop by my blog as well.hmmmm...my fave icecream? I think I'd have to say strawberry cheesecake flavored. I am traveling on my magic carpet from Connecticut. Wow these are amazing! What a great giveaway, please count me in! If you have time and have not yet done so, please come and visit mine (154 on the magic carpet). Greetings from bonny Scotland and enjoy the ride! Love the ring - stunning! It's a unique looking ring, I'd love to be included in the draw. I would love the ring! And I love Heavenly Hash icecream--yum! Thanks for the chance to win. I love the giveaways...Please enter my name in your drawing, too. Thanks! awesome giveaways! my favorite ice cream is a gelato - strawberry gelato! I like your blog set up. Very cool. Love the ring and your giveaways..please enter me. Favorite icecream is chocolate and chestnut. Oh wow... I just LOVE your Vanessa ring! And what a great blog you have too! My favorite ice cream is coffee :) Please enter my name into your fabulous drawing for a chance to win. Love the ring- made from an authentic spoon? I used to have one when I was in high school in the....yikes...I don't want to say when. I'm Nancy from cold and snowy Michigan and my favorite ice cream? hard to choose one but I would have to go with mint chocolate chip. Please add my name to your generous giveaway. I hope you are having fun checking out all these creative people and blogs. Amazing! What a gorgeous ring. I adore that style of jewelery. I would be thrilled to win it. I am a SAHM of 2 girls, I love my crafting and I do volunteer work for my church by taking a craft group. I also volunteer at my children's school. My favourite flavour of ice cream is triple chocolate. It is delicious chocolate ice cream with chocolate chips and chocolate sauce swirled through. It is available at a local ice creamery and it is heaven. I have not seen one of these in a long time. Your ring is heavenly! Please enter me to win, and stop by my blog to win my necklace, if you haven't already (#922). Well, I'm off to the next magical destination! Dear Jen.....Your ring is lovely! Thanks for visiting me through One World One Heart. It's a pleasure to meet you. :) The ring you are offering is absolutely lovely! I've not quite seen anything like it before. Hope our paths cross again soon. Thanks for visiting me. The ring is stunning. Please include me in your drawing. I would love to be included in your wonderful drawing. Butter pecan is my favorite. Great drawing! Favorite ice cream, black cherry. Gorgeous ring! My fave ice cream is Tin Roof, nummy! Wow this ring is so beautiful. What a unique and wonderful giveaway! Please sign me up. And please check out my blog for more OWOH action! Great giveaway...the ring is beautiful. As for my favorite ice cream...that's hard I LOVE ice cream. I guess I would have to say Breyer's Peanut Butter Tracks...mmmmm. I would love that ring and I would never take it off! What lovely prizes you have selected for this event. I would love a chance to be the lucky recipient of a gift from you. Please add my name to your drawing! Thanks for participating in the OWOH event. Such generous gifts you are giving. That ring is so very pretty. Thanks so much for the chance to enter. thanks for following me! great giveaway! Your gifts are just lovely!! I would just treasure the little spoon ring~ I've had one identical to it on my wish list since last year!!! Please enter my name into your drawing! And if you haven't already, please enter mine #135 to win 1 of 3 prizes!!! OH, and as for favorite ice cream...I'd have to go with Ben & Jerry's Vanilla Heath bar Crunch!!! Yum. Awesome! Thanks for flying by my blog!